Hello PokeBeach readers, Rukan here! A month ago, I began early playtesting of the Forbidden Light Standard Format. Now, with barely a month left until Madison Regionals, it’s time to report my findings. Join me as I explore some new archetypes and try to get a leg up on the competition. I’ll begin the article with a brief meta overview, before discussing the new Malamar / Ultra Necrozma-GX deck in depth and Buzzwole-GX / Lycanroc-GX briefly, and closing with a few final thoughts for Madison. After significant playtesting, Buzzwole-GX / Lycanroc-GX and Malamar / Ultra Necrozma-GX stood out as the top two decks in the format. At first, I wasn’t sure if Buzzwole-GX / Lycanroc-GX could stand up to a strong Psychic archetype, but I reconsidered this after playtesting. Buzzwole-GX / Lycanroc-GX is the stronger archetype of the two and tends to take better matchups against the rest of the field as a result. Meanwhile Malamar / Ultra Necrozma-GX takes a slight type advantage over Buzzwole-GX / Lycanroc-GX but a weaker matchup against the rest of the field. I believe any other decks that wish to succeed at Madison need to beat these two archetypes, but this is easier said than done. At first glance, Espeon-GX / Garbodor seems very good because it has the type advantage to deal with Buzzwole-GX and Ability lock for the Malamar / Ultra Necrozma-GX matchup. But traditional Espeon-GX / Garbodor lists cannot answer Dawn Wings Necrozma-GX effectively. And new Buzzwole-GX / Lycanroc-GX decks might in fact be strong enough to compete with Espeon-GX / Garbodor. Zoroark-GX / Garbodor does answer Dawn Wings Necrozma-GX efficiently, but at the cost of a type disadvantage against Fighting decks. Perhaps a Psychic-heavy Zoroark-GX / Garbodor variant can beat Buzzwole consistently, but I am not optimistic about this. Before Forbidden Light, Zoroark variants competed with Buzzwole-GX / Lycanroc-GX by running a single copy of Mewtwo or Mew-EX. Based on my testing, that won’t be enough after Forbidden Light hits the field. Meanwhile, a Zoroark / Lycanroc with three copies of Parallel City only tested moderately well against my early Malamar builds. The matchup became favorable when I cut some copies of Field Blower and Parallel City from my Malamar lists to beat Buzzwole-GX / Lycanroc-GX more consistently. It may be possible to build Zoroark-GX / Lycanroc-GX to take neutral matchups against the top two decks. The Malamar matchup may even be favorable if Malamar players choose to not respect Zoroark-GX, but it will most likely an uphill battle requiring significant tech card counts to simply compete evenly with the field. In general, I do not like the idea of teching a deck to go neutral against the field. 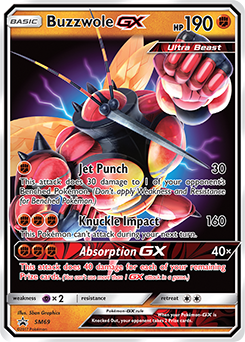 Beast Box (Naganadel-GX and other Ultra Beasts) might seem like a good counter to Fighting variants, but in practice, Buzzwole-GX often trades Prizes evenly with Naganadel-GX. As a deck, Buzzwole-GX / Lycanroc-GX possesses more ways to swing the Prize race to a “seven-Prize game,” with the new “baby” Buzzwole, Lycanroc-GX, Mew, and the like. Considering the low power level of Beast Box and its type disadvantage against Dawn Wings Necrozma-GX, Beast Box needs to have an extremely favorable matchup against Buzzwole variants to remain relevant in the meta. But when Beast Box only takes a neutral matchup against Buzzwole-GX / Lycanroc-GX, I see no reason to bring it to Madison. I’ve heard a few players mention M Gardevoir-EX, which has a type advantage against both Buzzwole-GX and Ultra Necrozma-GX. 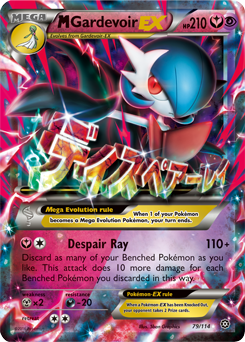 But it suffers from the same issues as Beast Box: that is, M Gardevoir-EX itself is a relatively slow two-Prize Pokemon that, in practice, only trades two Prizes for two Prizes against Buzzwole-GX and Ultra Necrozma-GX. Gardevoir already struggled against Buzzwole-GX / Lycanroc-GX before Forbidden Light. After Forbidden Light , the matchup becomes borderline unwinnable, even with the inclusion of multiple copies of Mewtwo in the Gardevoir-GX deck. Meanwhile, Malamar / Ultra Necrozma-GX simply trades KOs with Gardevoir-GX and also tends to set up more consistently. I only bothered to test nine games against Gardevoir-GX with new Forbidden Light decks. Buzzwole won six of six games and Malamar won two of three games. Despite this limited playtesting sample size, both my opponents (Eric Gansman and Sina Ghaziaskar) concluded that Gardevoir-GX could not compete in the upcoming format based on the results. Greninja can never really have favorable matchups against aggressive decks like Buzzwole-GX / Lycanroc-GX. It only won one of six games in my testing against that deck. Greninja not only needs to have a very quick setup against Buzzwole-GX, it also needs to prevent the Buzzwole-GX player from activating either Beast Ring or baby Buzzwole. On the upside, Greninja can shut down Malamar decks completely if the Malamar player doesn’t run a copy of Giratina, but Greninja loses convincingly if a Giratina does hit the field. Ultra Necrozma-GX‘s GX attack does a great job of fixing math against Greninja. The combination of Ultra Necrozma-GX and Giratina typically gives that deck advantage in the Prize race, even in scenarios where Malamar misses a turn-two or even turn-three attack. Considering how painlessly Malamar / Ultra Necrozma-GX can incorporate Giratina into deck lists, as well as the mediocre Buzzwole-GX / Lycanroc-GX matchup, I don’t consider Greninja a strong pick for Madison. In Fighting decks, Lucario-GX gets outclassed by new toys such as baby Buzzwole and Buzzwole-GX with Beast Ring. As a partner for Buzzwole-GX, Lucario-GX doesn’t answer Dawn Wings Necrozma-GX as well as Lycanroc-GX does. And I do not believe Zoroark-GX / Lucario-GX has take a favorable matchup against Buzzwole-GX variants after the introduction of Beast Ring. Simply put, this deck is too slow for to compete with either Fighting decks or Malamar decks. Even through Armor Press, neither Buzzwole-GX nor Ultra Necrozma-GX struggle to hit 230 damage. I heard some rumblings of this deck in the Japanese meta, and I wanted to try it out. The deck provides type advantage against both of the Buzzwole-GX and Lycanroc-GX. The hefty 160 HP on Alolan Exeggutor also works very well in combination with Garbotoxin. In playtesting, however, the deck did not beat Buzzwole-GX / Lycanroc-GX consistently. Both Garbodor and Alolan Exeggcutor take several turns to hit significant numbers. Meanwhile, Buzzwole-GX easily OHKOs Trubbish and Exeggcute with Jet Punch. Buzzwole-GX / Lycanroc-GX can often take a two- to three-Prize lead, enough to handle two-for-one Prize trades in the late game.